The European Central Bank rejected U.S. accusations of currency manipulation on Monday and warned that deregulating the banking industry, now being openly discussed in Washington, could sow the seeds of the next financial crisis. Arguing that lax regulation had been a key cause of the global financial crisis a decade ago, ECB President Mario Draghi said the idea of easing bank rules was not just worrying but potentially dangerous, threatening the relative stability that has supported the slow but steady recovery. Draghi’s words are among the strongest reactions yet from Europe since U.S. President Donald Trump ordered a review of banking rules with the implicit aim of loosening them. That raises the prospect of the United States pulling out of some international cooperation efforts. The ECB supervises the euro zone’s biggest lenders. Andreas Dombret, a member of the board of Germany’s powerful central bank, the Bundesbank, said that reversing or weakening regulations all at once would be a “big mistake”, because it would increase the chance of another financial crisis. “That is why I see a possible lowering of regulatory requirements in the U.S., which is under discussion, critically,” said Dombret, who is also a member of the Basel committee drafting new global banking rules. Roberto Gualtieri, chairman of the European Parliament’s economic and monetary affairs committee, also criticized Trump. “Some first concrete confirmations of a new more unilateral policy stance by the new U.S. administration, including on sensitive financial markets regulatory issues, raise concerns and require both thorough reflection and action from the EU side,” he told the committee. Draghi’s U.S. counterpart, Federal Reserve Chair Janet Yellen, has come under pressure to step back from international regulatory cooperation. Indeed, an influential member of the Senate recently called on Yellen to end talks in forums like the Basel Committee on Banking and Supervision, some of whose proposed rules he said would disadvantage the United States. “It is incumbent upon all regulators to support the U.S. economy, and scrutinize international agreements that are killing American jobs,” Patrick McHenry, the Vice Chairman of the Senate’s Financial Services Committee, told Yellen. Draghi also rebuffed accusations by Trump’s top trade adviser that Germany, the euro zone’s biggest economy, is using a grossly undervalued currency to take advantage of the United States. 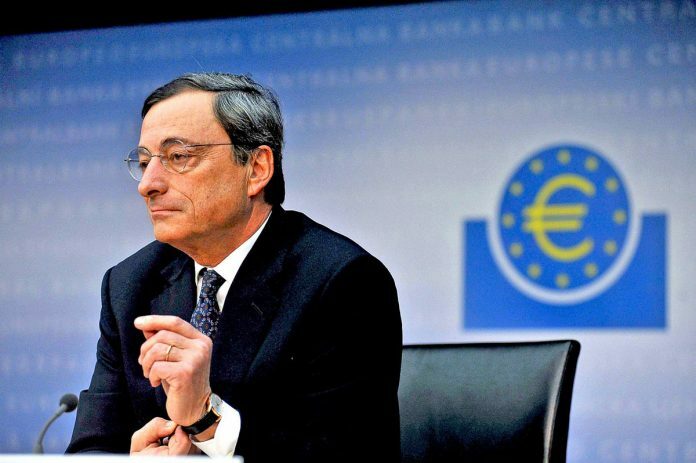 He argued instead that economic weakness is the main reason for the weak euro. Germany runs a massive trade surplus with the United States and Trump trade adviser Peter Navarro said it was now exploiting this to America’s detriment, de facto accusing Berlin of currency manipulation. But Germany does not set monetary policy and has repeatedly complained that ECB policy is actually too easy, calling on Draghi to end its massive stimulus program. “The single market would not survive with continuous competitive devaluations,” Draghi said. But the ECB chief also said no policy tightening was coming as growth was still weak and faced with risks, while the inflation spike is still temporary, all indicating that monetary support is still needed. “Our monetary policy strategy prescribes that we should not react to individual data points and short-lived increases in inflation,” Draghi said. “We therefore continue to look through changes in (harmonized) inflation if we believe they do not durably affect the medium-term outlook for price stability. Euro zone inflation hit 1.8 percent in January and is likely to exceed the ECB’s target of almost 2 percent in the coming months, but underlying inflation is still half the headline figure.